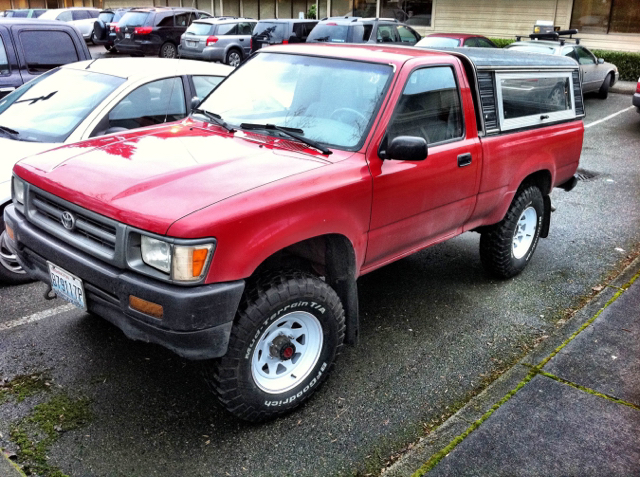 My first 4x4 was a '93 Toyota pickup, standard cab, 5sp MT, no options (no power steering, no A/C, no stereo, nada), and a small canopy on the back with side doors. I absolutely loved that truck, but after gutting it out in 90º+ heat for nine hours on the way home from the great eclipse apocalypse with the windows rolled up and the vent set to recirc to avoid the trail dust, I started thinking about something newer, safer, and air conditioned. ...Fast forward a year and some change and I finally took possession of a 2011 cavalry blue FJ Cruiser. It has never looked as spiff as that first day, dripping with armor all and nary a scratch in the paint. But now it looks like it should—well-used. During the shopping process, I mentioned to a colleague that I was looking for a new vehicle and considering the FJ. “You’d sell your truck to get The Jerk? !” she said, incredulously. “The Jerk?” I asked. “Yeah, everyone who got one for a while seemed to be a total jerk...” I thought it was hilarious—the name stuck. 2011 FJC, off-road package (I think this included the roof rack and Bilstein shocks), 6sp MT, 60k mi. Purchased new in Juneau, AK and then shipped to Oregon. I’m the 3rd owner. 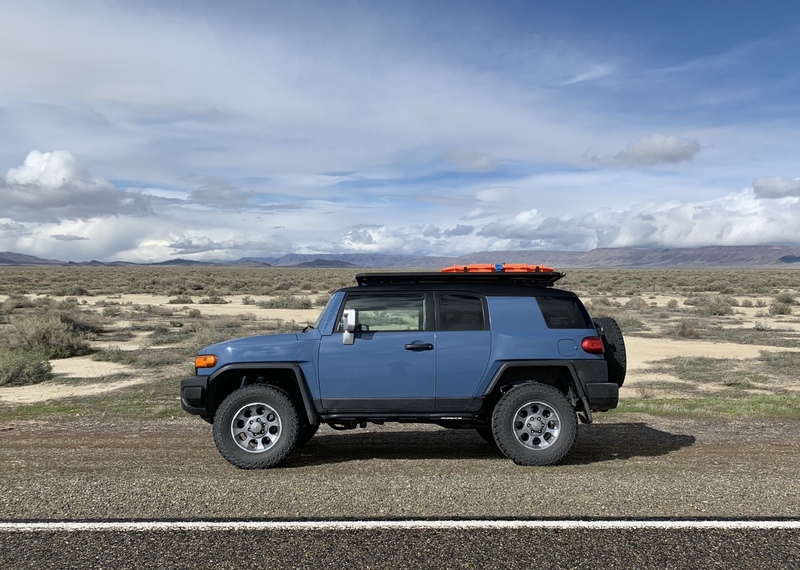 My primary intent with this vehicle is car camping and exploration. 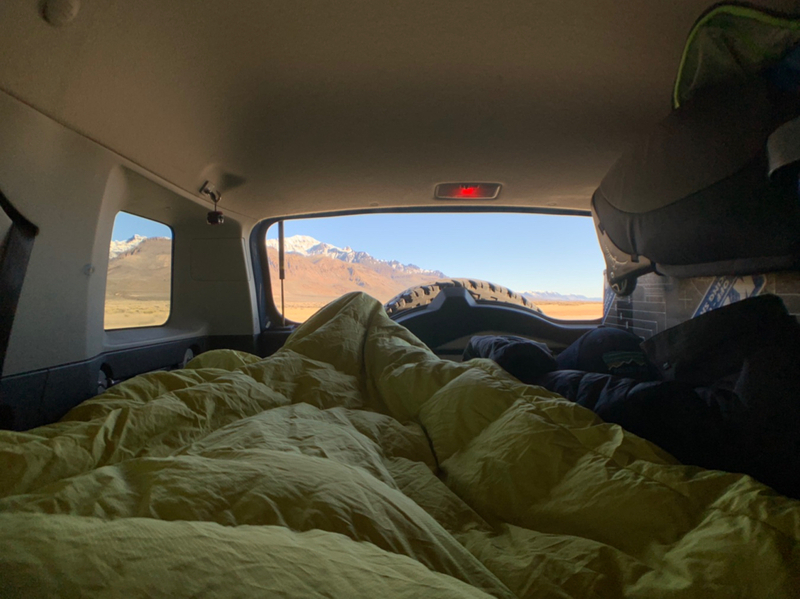 I guess we call it “overlanding” now because car camping is not cool. 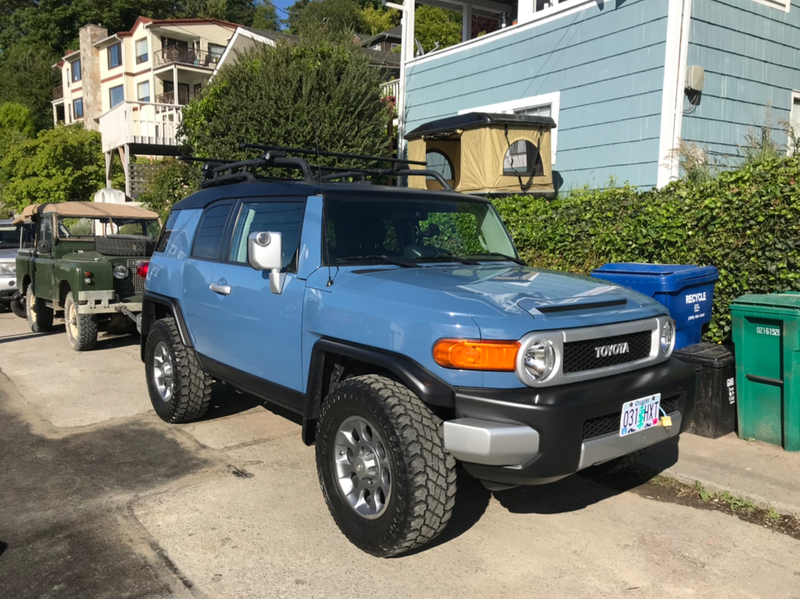 I have relied heavily on various posts and build threads here as I continue to mod my FJ, so hopefully someone finds this thread useful as I learn more along the way. BOBTAILFJ, IDFJ, CRFjockey and 6 others like this. Last edited by umami; 04-14-2019 at 08:55 PM. Cheaply done by a previous owner. Makes the roof hot enough in the summer time to cook a steak. I like the look better than white, but it’s functionally worse. Might get the roof painted to match the body eventually. I love the monochromatic look. Taking an idea started by @minhster , I initially thought the FJ wasn’t long enough to accommodate my 6’2” height. 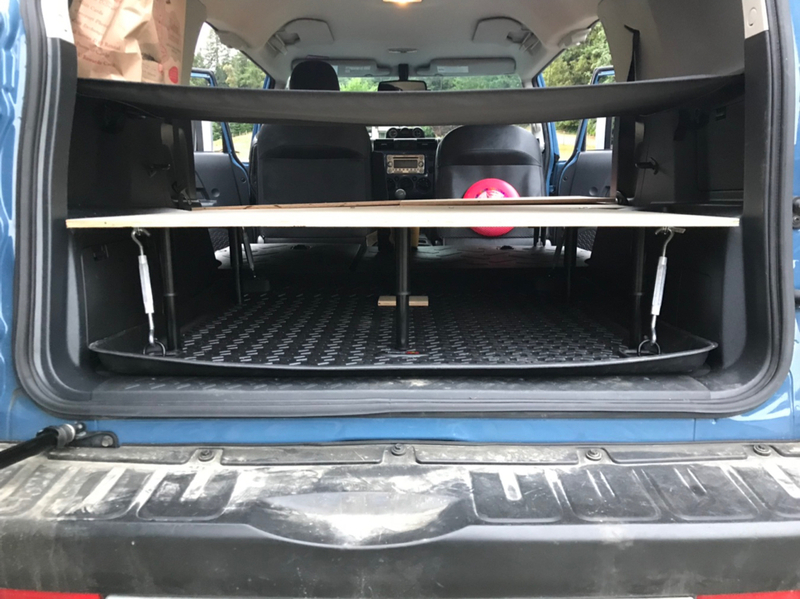 It’s possible I have an unusual front passenger seat, but it tilts forward just enough to allow a full 6’4” to the tailgate. Perfect—sleeps better than my truck ever did. I was really bummed out to give up being able to sleep in my vehicle. 1/2” plywood on IKEA Sultan legs. These things are threaded internally, so the length can be adjusted. Turnbuckles to anchor the platform to the bed. The platform is silent on bumpy roads (at least until the turnbuckles loosen up and it starts squeaking). Holds two adult bodies easily, and whatever cargo I can throw at it. Vehicle weight is a major concern for me, so going light is key. These pics are from the initial build—it’s not as warped as you see here. 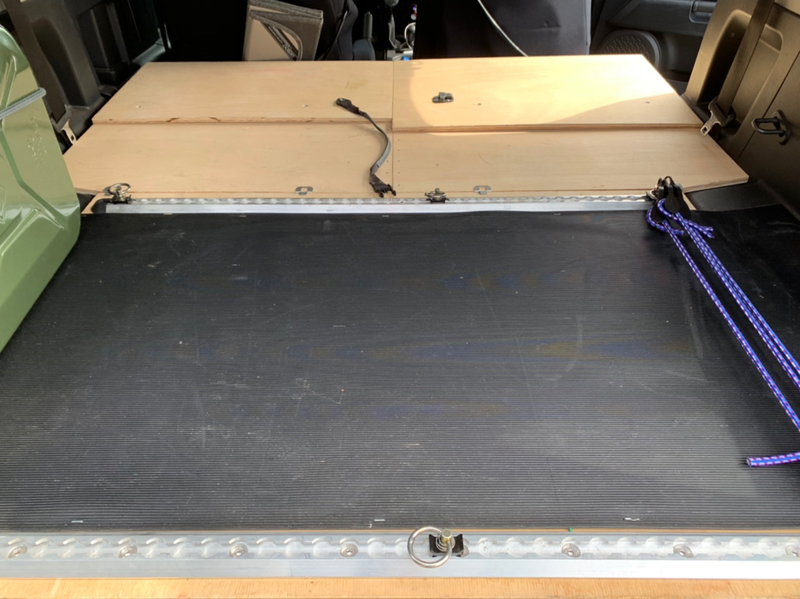 The middle section is hinged for easy removal and attaches to the rear section with Simpson Strong-ties and some window latches to snug things together. Strong-ties are fairly low profile, though they do bend easily. I’ll probably replace this with something a little higher quality eventually. There is a set of removable Sultan legs underneath for support. 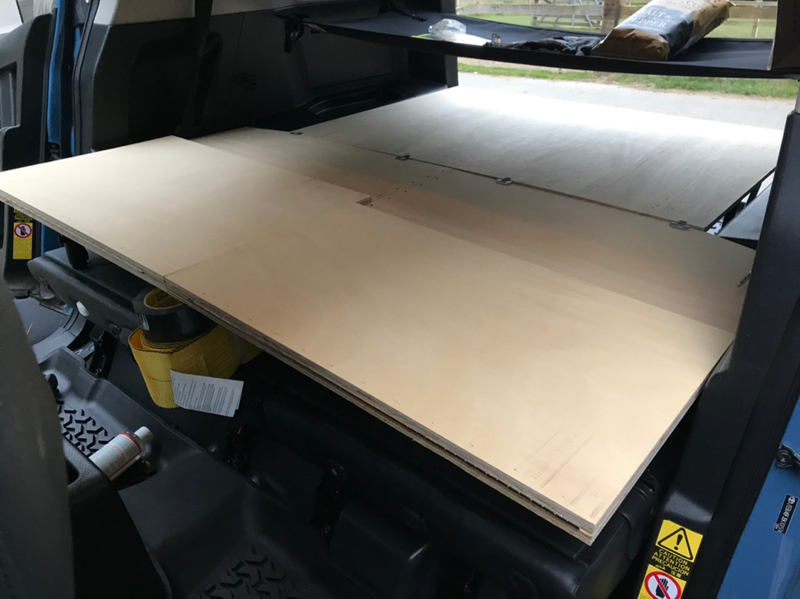 Two panels then fold out to create the forward section. More pics to come, stay tuned! amaclach, FJFool, Loganbeere and 1 others like this. Agree the black roof looks good but yes works as a good heat sink. Nice start to your build and looks great in the top picture. Is the Series II yours too? It’s the pickup mentioned in the first post. 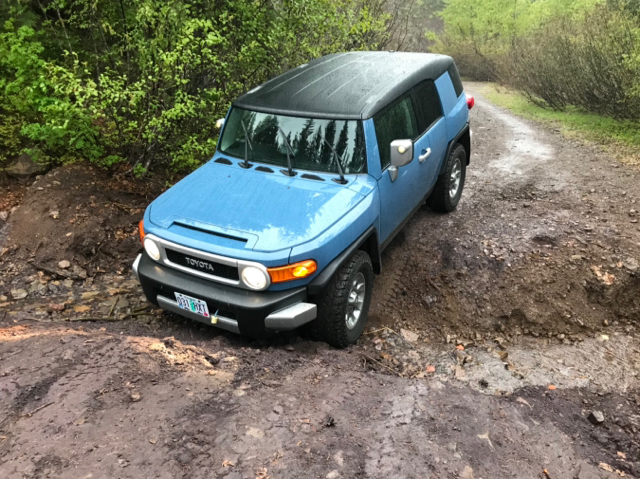 Sold it when I got the FJ to a good home. I still miss how small and light it was. Here are some shots of the bed as it currently exists. I added L-track to the rear section for cargo—provides endlessly variable anchor points. The anchors rattle if they’re not attached to a tie down, so fortunately they come off easily. Shown here are the middle section Sultan leg supports. 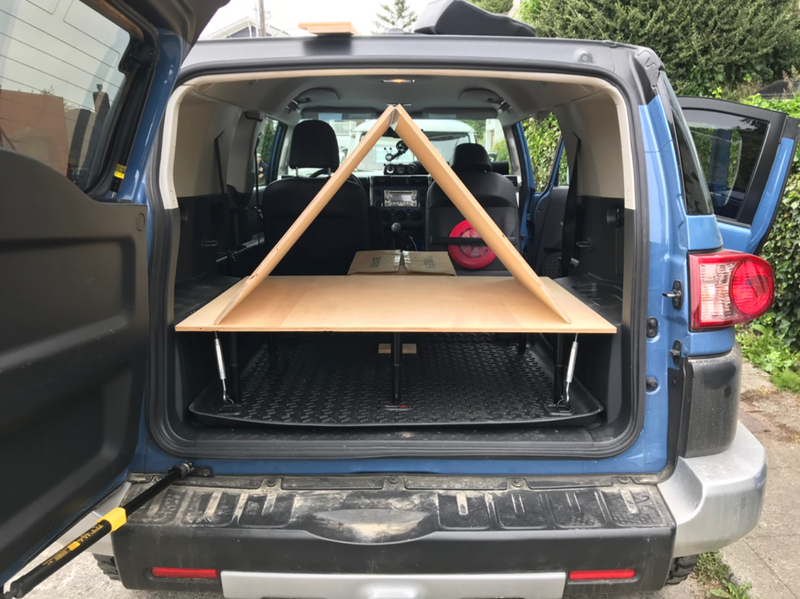 I didn’t like the pressure points from the bare feet, so mounted them to some plywood to distribute the weight on the seat backs. 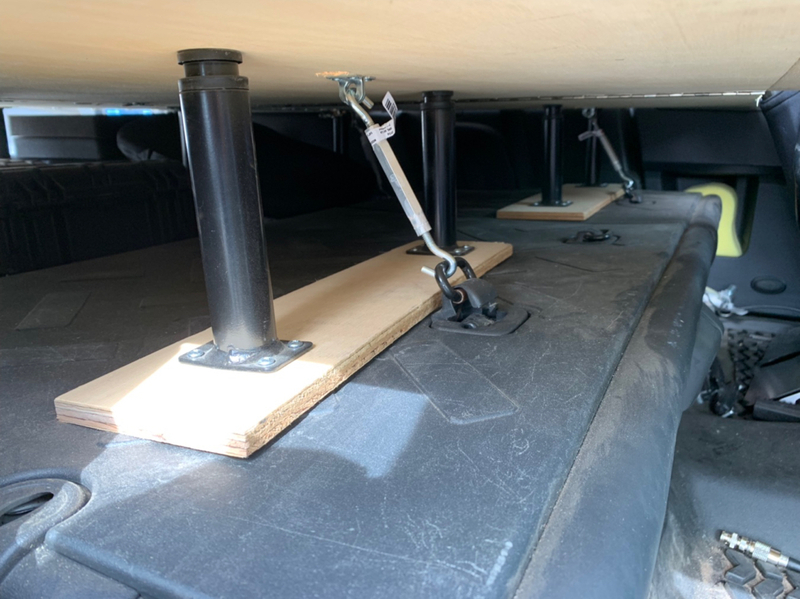 The two pieces simply rest under the bed and the turnbuckles hold everything under compression. Here’s the two sections connected from the underside. The window latches pull the two panels together and snug up any slop. It pains me to see how poorly aligned things are, but I’m considering this a prototype design. There was definitely some trial and error in getting things to fit the first time around. Finally, here’s the front section folded open on the passenger side. 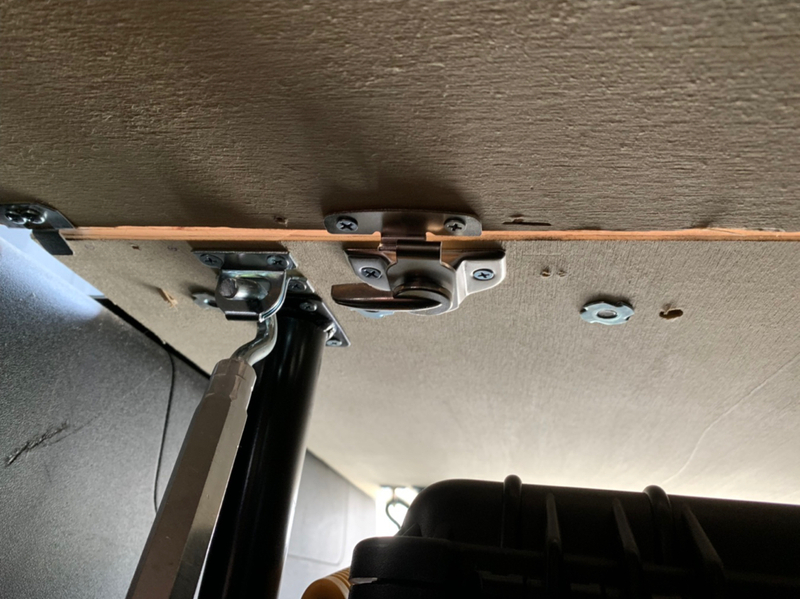 Two PVC pipes with end caps thread into t-nuts under the bed and rest on the seat rails. I can put my full weight on any section without issue. 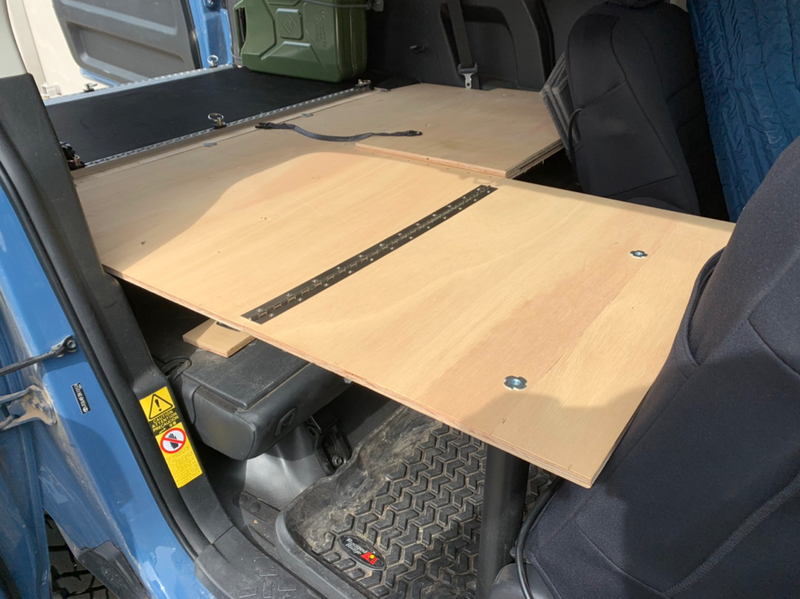 I have a bit of crap on the front seat, so couldn't push it all the way forward for this pic, but the bed does not bite into the seat back as badly as you see here. It's snug, but repeated use has shown no wear or damage to the seats. BOBTAILFJ and amaclach like this. I know this is obscure but you can also call your truck as follows. You must be either an engineer or a physicist.